Johannesburg, Boksburg – Astore Keymak, a member of Hudaco Trading and the only recognised Southern African distributor of the UNIDELTA range of compression fittings and saddles, regrets to inform consumers of an influx of UNIDELTA knock-offs being imported, by a number of companies operating within the pipes, fittings and valves sector. 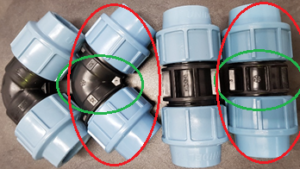 These fittings are inferior, as proven by comparative testing, and some have failed recognised international standards requirements. These fittings also infringes on the UNIDELTA Trade Mark and is subject to legal action. Astore Keymak and UNIDELTA are working closely together to manage this situation and ensure our current and prospective customers are not impacted by this scam. The following guidelines have been compiled by Astore Keymak to ensure customers looking for UNIDELTA products do not fall victim to these inferior knock-offs. Where to purchase genuine UNIDELTA Products? Astore Keymak branches located across South Africa or via an order through one of our experienced product managers. How to identify a genuine UNIDELTA Product? The word UNIDELTA and Made in Italy is clearly printed on the product. What UNIDELTA products are being affected the most? Currently more than 90% of the UNIDELTA range of products are being sold as knock-offs by 5 companies. What to do if you have purchased a “knock-off” UNIDELTA product? If you have purchased a knock-off UNIDELTA product contact or visit your nearest Astore Keymak branch.